The Tigers opened Spring Training last week in Lakeland without having done much to improve on their 2018 campaign. This offseason they signed Matt Moore, Tyson Ross, Jordy Mercer, and the standard contingent of minor league free agents. Moore, Ross, and Mercer were all solid signings, as they all have the potential to reclaim some past glory and provide the Tigers with a nice little return on their investment. 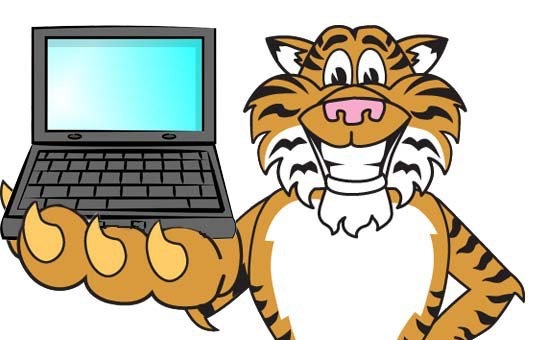 But the 2018 Tigers were not a team that needed tweaks to contend in 2019, they needed big upgrades. The 2018 Tigers won 64 games, which is the same number of games they won during the 2017 season in which had the worst record in baseball. Now of course there is no way to guarantee a great season, or even a contending season, but the Tigers haven’t done anything this winter to even make an attempt at getting into the wild card or divisional race. That is especially odd given how little most of the other teams are doing to truly improve themselves. Obviously the Tigers were in bad place in 2017 and trading away their good, aging veterans made tons of baseball sense. They were unlikely to win with the core they had assembled and rather than stumble through the next couple of years, they blew up the roster and turned Verlander, Martinez, Upton, et all into players who would help them win in the future. Trading now talent for future talent was a wise baseball move. The financial savings from getting Verlander off the books was relatively unimportant from a baseball perspective, but the long term talent wasn’t. Going into 2018, there really wasn’t a way to build a winner through free agency given the roster they had. There were too many holes and not enough available players to make it a great short term move, and it certainly wouldn’t have made sense long term. But 2019 is different. The current Tigers roster is probably assembled to win around 70 games, give or take. That’s not a great team at all, but there is a lot of room for growth and there are a lot of good players still available in February. Bryce Harper. Manny Machado. Dallas Keuchel. Craig Kimbrel. Marwin Gonzalez. These are potentially large upgrades for the Tigers this year, with many of them having the potential to be good for the next several seasons. This is to say nothing of the many players the team could pick up on one- or two-year deals to help bridge the gap (e.g. Adam Jones). Why aren’t the Tigers making serious plays for at least some of these players? It’s reasonable for the team to look at their current roster and think they probably can’t win the division in 2019 even with some major upgrades. But they can certainly sniff the wild card, and more importantly, the players they sign in 2019 will be on their team in 2020 and 2021 when their prospects start graduating. The Tigers shouldn’t sign a 34-year-old 1B/DH to five-year deal right now, but Harper and Machado are in their mid-20s. They will still be in their peak years in 2020, 2021, and 2022. And it’s not like the Tigers can pass on Harper this year, save the $35 million and then sign him next year. That’s not how it works. The Tigers are also not in any kind of financial crunch. In 2018, they had the 20th highest payroll in the league at around $125 million. This was a stark contrast to the 10 previous seasons in which their payroll was in the top 10, including nine seasons in the top six. They had payrolls in the high $190M range in 2016 and 2017. Clearly, a major difference is that Mike Ilitch died and his son is now running the team. Chris Ilitch isn’t trying to win a World Series as urgently, which makes sense given that he’s not in his 80s hoping for one last taste of glory. I get that Chris Ilitch isn’t going to push Avila to mortgage the future and spend like there is no tomorrow, but he’s used that cover, the cover of the 2017 rebuild, and the fact that the rest of the league is pretending they can’t afford free agents to completely avoid investing in the team. The Tigers payroll in 2019 might end up being less than it was in 2018, and even if it’s higher it will be roughly in the same place. There is no justification for that. The Tigers were financially capable of handling payrolls near $200 million a couple of years ago. The fact that they aren’t even close to that is indefensible. The league as a whole is making tons of money, the Tigers are closing in on a new TV deal (either with Fox or their own RSN), and the Ilitch family shows no signs of being in a difficult financial situation. The Tigers aren’t spending money right now because they don’t want to, and the only reason they don’t want to is because the ownership group would prefer to have higher profits. Put another way, there is no baseball reason why the Tigers shouldn’t be out there trying to sign some of these marquee free agents. It would be one thing if every player had a bidding war going and the Tigers decided they didn’t want to overpay for Harper or Machado given that they probably aren’t going to get a ton of value out of the 2019 version, so a team like the Yankees might be able to spend more. But that’s not even the case. The Tigers could get these guys for less than they’re actually worth and they don’t appear to be trying. They have room on the balance sheet, they need big upgrades, and they are in the market for a new generation of stars to carry the marketing side of the organization. Harper could be with the organization for a decade, selling merchandise and earning a spot on the brick wall, but the Tigers appear content to give that up so that the Ilitches can…have more money? The Tigers could be a lot better in 2019 if they went out and signed free agents, but much more importantly, they could set themselves up for real greatness in 2020 to 2022 if they acquire building block players right now who will be there when Mize, Manning, Paredes, and Perez coming knocking. There is still time. We are in the midst of a league-wide cheapskate crisis, meaning that there are great players still available on the market in mid-February. If the Tigers want to build a winner now and into the near future, the path to return to the top of the Central is wide open. All it will take is spending money that they have. It will cost them nothing in prospect talent. Going into 2019 spending less than $130 million on the big league roster is a joke for an organization with the history and resources of the Tigers. The fans in Detroit want a winner and the leadership of the team isn’t even pretending like they care. Mike Ilitch sometimes overspent on big name veterans, occasionally to his detriment. But you can bet if he had a change to sign generational talents at age 26, he wouldn’t be sitting on his hands talking about payroll flexibility and rebuilding. Mike Ilitch would have spent the money because Mike Ilitch wanted to win as desperately as any owner in recent memory. There is still time his successor to follow that example. The Tigers season ended Sunday as Efren Navarro flew out to left, but of course the writing was on the wall much sooner. The Tigers last led the division on April 26th. They were last .500 on June 4th. They were last within three games of the division lead on June 16th. They were last within 10 games of the division lead on August 10th. The club went 6-25 in September and finished 64-98. In 2017, they tied for the worst record in baseball and will pick first in the 2018 draft. Unlike in previous years, this requiem need not consider the randomness of baseball. Unlike in previous years, a few lucky bounces or one fewer injury would not have made a difference. The 2017 Tigers started the season looking like a team built well enough to contend for a wild card, but by the All-Star Break it was clear this team would fail. Jordan Zimmermann did not pitch well for most of the year. Anibal Sanchez provided little. Matt Boyd and Daniel Norris had good performances and bad. 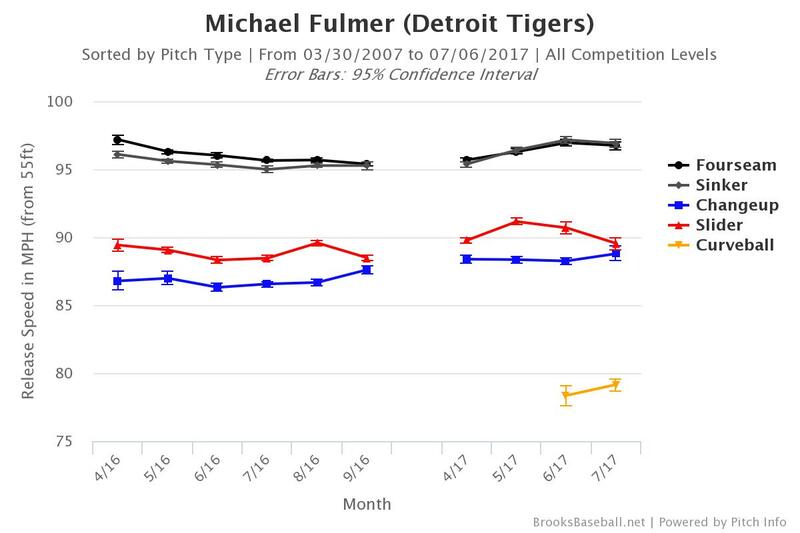 Michael Fulmer was good, but got hurt. Justin Verlander was solid, and was traded. Like most years, the bullpen had a couple of good arms and then a collection of unsuccessful performances. The Tigers pitching was probably not the worst in baseball in 2017 but combined with an unremarkable defense, the club allowed more runs than any other team. The offense was a little better, but by the end JD Martinez, Justin Upton, and Alex Avila had been traded, pulling most of the good performance off the field for the final couple of months. Nick Castellanos, Mikie Mahtook, and James McCann had solid seasons given expectations, but Ian Kinsler, Miguel Cabrera, Victor Martinez, and Jose Iglesias all underperformed to varying degrees. It was the first time the Tigers collectively produced a below average offensive output since 2009. When a team fails this completely, there is not one primary cause. Miguel Cabrera was obviously the biggest single problem, but even if he was a 6 WAR player instead of replacement level, the team still wouldn’t have made the playoffs. If Cabrera had hit well, if Kinsler or Victor Martinez had provided more offense, and if one of the mediocre starters stepped up, you could imagine a world in which the Tigers hold JD Martinez and Justin Upton and find themselves chasing the Twins for the second wild card. The final results look really bad, but the club traded two critical offensive players, their ace, and their closer along the way. The Tigers nearly lost 100 games, but this team had the character of a 90-loss team that was blown up to make way for the future. And it is in the future that we may remember 2017 fondly. While we were living it, we were miserable. The Tigers didn’t provide a particularly compelling brand of baseball this year. There were some good performances and great moments — every baseball season has them — but the season slipped away early and the most enjoyable components of the team now wear other uniforms. But those trades brought back a lot of players who will be a part of the next competitive Tigers team. Dawel Lugo, Sergio Alcantara, Jose King, Jeimer Candelario, Issac Paredes, Grayson Long, Franklin Perez, Daz Cameron, and Jake Rodgers have fortified the Tigers farm system. They won’t all make it to the show and the ones who do won’t all shine, but suddenly the Tigers only have two big contracts that you’d like to get out from under and a nice bunch of young players who will be able to make an impact in 2019, 2020, and beyond. Years of throwing caution to the wind and going for it finally caught up with the Tigers and they recognized it, pulled the rip cord, and started fresh. The 2017 season will be remembered as a hinge. The next Tigers contender will look nothing like the 2014 team that won the division. The trades will forever define this season. That’s all we’re going to remember. It will be the year Ilitch died, Verlander was traded, and Ausmus was fired. The hundreds of hours we spent watching frustrating baseball will fade from memory. Whether the season is remembered fondly will depend on the careers of the prospects the team acquired. The legacy of 2017 depends on what happens in the future, ironically. I attended one game this year. As far as I can remember, it was the first Tigers game I attended since 2010 that carried no postseason implications. That’s a bit deceptive, because I didn’t go to any late season games in 2015, but even during the course of the last decade, we’ve watched a relatively small share of meaningless baseball. The Tigers were in the race for all or most of the year except for 2008, 2010, and 2015 prior to 2017. We’ve fallen out of practice at caring about games that carry little meaning. Fortunately Matt Boyd reminded me how to care two Sundays ago as he completed the first 26 outs of a no-hitter. Last night, Andrew Romine gave us another reminder when he became the fifth person to play all nine positions in one game. It’s been a long year, but even in long years there are things to hold onto. There are 179 days until Opening Day. With the non-waiver trade deadline behind us, the Tigers face a two-month slog toward the offseason. We’ll get a chance to test the waters with a few new relievers and the organization will take a long, hard look in the mirror as it prepares for what is sure to be an important winter. I wrote in June that it was time for the Tigers to tear things down and rebuild. While the club correctly assessed that the 2017 season was over, they held back on making any moves related to their long-term future. The Tigers traded JD Martinez and Alex Avila, free agents at the end of 2017, and Justin Wilson, a free agent after 2018, but did not make deals involving Verlander, Kinsler, Iglesias, Castellanos, Upton, or Cabrera. In other words, the Tigers made the trades that they absolutely had to make at the 2017 non-waiver trade deadline. Holding Martinez or Avila would have been nonsensical and Justin Wilson’s value would certainly have been much lower this winter when teams were under less pressure to upgrade their bullpens. If they had failed to trade any of those three players, it would have been a failed deadline. Everyone else is either tradeable in August, this winter, or later, so the fact that the Tigers didn’t go further isn’t yet evidence of anything. Before we take a broader view, let’s start with the deals they made. Many people panned the Martinez deal for an apparently light prospect return, but now that the deadline has passed it’s quite clear that the demand for corner outfielders was low and that teams were not motivated enough to acquire rental hitters to part with big prospects. Lugo, Alcantara, and King aren’t a murderer’s row infield, but the Tigers had to trade Martinez and looking around the league at the deadline indicates there wasn’t some team lurking and waiting to pay a lot more for JD. Lucas Duda, Melky Cabrera, and Todd Frazier were the only other notable corner bats to move and the Sox only got more for Frazier because he came with two good relievers. Wilson and Avila brought back a more crowd-pleasing pair in Candelario and Paredes, one of whom is close to the majors and one of whom is not. They will probably both move down the defensive spectrum but they could both provide plenty of offense as well. Neither trade blows you away in the way that the Price or Cespedes deals did two years ago, but the Tigers were dealing players who were either slightly worse or in lower demand at the time. It’s hard to knock the execution. The system is deeper today that it was a couple of weeks ago and it doesn’t appear like another team would have ponied up a lot more for either set. But our focus now has to turn to the broader vision. The tactical execution of the deadline went well, but the strategic approach to the organization remains a question. The Tigers knew they were licked in 2017, but are they still considering holding things together for 2018 or did they simply not like the offers they heard on other players and are ready to try again in August and December? There’s no harm in holding Verlander if you expect to get a better return later, but if they are holding the core together because they haven’t decided to blow it up, that’s more troubling. As I wrote in June, the Tigers have to make a big decision and their recent pattern has been to delay that decision as long as possible. If they’re not willing to run a very high payroll, they should begin a rebuild immediately. You don’t get extra credit for winning games with homegrown talent, it’s just a cheaper way to play. If you draft and trade well, you can acquire players and get their peak performance before they hit free agency. That saves money, but it’s not the only way to win. If the Tigers are willing to spend, they can keep playing the free agent market indefinitely. Ownership seems unwilling to push their payroll much higher than it currently sits. If that’s the mandate, the team needs to rebuild because they won’t be able to be successful if they don’t. If they decide to rebuild, they need to be willing to trade everyone (except Fulmer) and eat a portion of their contracts. It’s hard to know what was rumor and what was fact, but the Tigers seemed unwilling to absorb a large portion of Verlander’s contract in a deadline deal. That’s absolutely the wrong approach. Most teams aren’t going to be interested in Verlander for $28 million a year. If they have $28 million to spend they can use it to sign a younger, better player on the market this winter. What the Tigers can offer other teams is Verlander at a salary well below market value. Doing so creates value and increases the prospect return. And that prospect return is how you rebuild. The same is true for guys like Kinsler, Iglesias, Castellanos, and Upton if he doesn’t opt out. Those players don’t have the same size contracts, but the Tigers should be willing to absorb money to get back better players. Miguel Cabrera is a special case because he’s performing so poorly at the moment, but they should absolutely try to trade him using the same contract absorption method once he looks healthy. The Tigers have good players who are paid like good players. Other teams wants good players, but they can get good players who are paid well on the free agent market. In order to create trade value, you have to offer good players at low salaries. That’s the decision the Tigers have to be willing to make as they approach rebuild. If the plan is to simply offload salary, the only justification is that they would turn around and sign new players on the free agent market. That’s also a fine approach. If you want to dump salary to chase Harper in two years, that’s okay. If you want to dump salary so the Ilitch balance sheet looks better during down years, that’s not. Al Avila completed a successful deadline but the real work is waiting. The Tigers have to chart a course. Either tear it down or spend a lot of money. I’m agnostic about the direction, but they have to pick a direction and start executing. Trying to hold this team together and improve around the edges is a recipe for failure. It’s the trade deadline. The Tigers are out of the race. They have a good reliever with one plus season of team control left. It’s pretty easy to figure out where this is going. Everyone needs relief pitching at the deadline and the Tigers had a darn good one to trade, so that’s exactly what they did today, sending Justin Wilson and Alex Avila to the Cubs for Jeimer Candelario, Isaac Paredes, and either a PTBNL or cash. Wilson came to the Tigers prior to the 2016 season in a deal with the Yankees and he’s performed as well as anyone could have expected. His fielding independent numbers have been terrific, roughly 25 percent better than league average during his year and a half with the club. This year, he’s been a strikeout machine (35 K%) and has been fortunate enough to run a .210 BABIP to balance out his unseemly .340 mark from a year ago. Wilson is a good left-handed reliever and it’s July so that made Al Avila a very popular man. Avila the younger has been slumping as of late, but still takes his 134 wRC+ with him to the North Side as insurance behind Willson Contreras. Avila has had a great year for the Tigers and given that he was signed to a one-year deal for $2 million this winter, getting anything of value back is a great outcome. We’ll have to watch Avila leave Detroit for a Chicago team for the second time in two years, but there was no reason to hang on to him for the remainder of this dreadful season. With the club looking unlikely to compete again in the near future, dealing Wilson and Avila was an obvious move. The only question was which team, for whom, and whether to deal them separately or as a package. Plenty of teams were in on Wilson, but it was the Cubs who made the offer the Tigers liked best and they were also interested in a catcher. For Wilson and Avila, the Tigers received Jeimer Candelario and Isaac Paredes. Candelario is a 23-year-old third baseman whose already had a cup of coffee in the majors and had success in the high minors as a switch hitter. The public scouting folks have complimented Candelario’s swing and approach, but there definitely appears to be some question as to whether he has the defensive ability to stay at third base or if his destiny is across the diamond. He’s received good marks for his arm, but the folks at BP and FanGraphs both raised questions about his glove. Paredes is an 18-year-old infielder with a lower floor and higher ceiling than Candelario given how much further he is from the show. The word on him is that he’s a good hitter for his age, but probably isn’t a shortstop long-term. I saw a few Cubs watchers suggest he’s on his way up and might soon receive more national recognition. I spoke with a contact in a different organization who said while Paredes isn’t terribly toolsy, his skills make him a good player with a chance to stay up the middle at second. Candelario is the kind of prospect you’d find at the back end of most Top-100 lists and Isaac Paredes, while much further from the majors, has the talent to be there in relatively short order. That’s a pretty nice return for a year and half of a pretty good reliever. Wilson isn’t Andrew Miller or Aroldis Chapman caliber, which is why he didn’t match their returns from a year ago, but he’s a solid arm with a below market salary. Candelario isn’t anyone’s idea of a top prospect, but he’s seasoned and on the cusp of the majors. Unlike the players the Tigers got back in the Martinez deal, Candelario could theoretically break camp with the team next April. Paredes is probably four or more years from the majors, but is definitely a real prospect rather than organizational filler to round out a deal. It’s impossible to know what else was available, but for two months of Avila and a year and two months of Wilson, the Tigers got back two players who could get near a Top-100 list next spring. Rankings are a bit of a crapshoot, but the opinion of the industry is definitely that both players have a real chance to be MLB regulars. This is a deal that makes the Tigers farm system better and improves the team’s odds of a shorter rebuild. Candelario and Paredes might not pan out, but given that they picked them up with no harm to their 2019 roster, it’s hard to say anything bad about the move. Amid a disappointing season, one of the commanding bright spots for the Tigers has been Alex Avila. After letting the homegrown catcher walk after the 2015 season, the Tigers brought him back for 2017 at $2 million and have been rewarded with 174 wRC+ in 186 PA. Avila has 10 HR and a .441 OBP. Granted, he’s served mostly against right-handed pitching but that’s one heck of a strong side of a platoon for next to nothing. Avila isn’t necessarily known for his receiving, but he controls the running game well and is generally considered one of the better game-callers in the sport. The picture on catcher defense can be a little hazy given how much of their role is strategic rather than performative, but other than on matters of framing he seems to be quite good. In fact, 2017 Avila — at age 30 — reminds me quite a bit of 24-year-old 2011 Avila. He’s striking out more, walking more, and hitting for more power, but the game is moving in that direction as a whole. What we’re seeing this year is essentially the kind of player we saw in 2011. He hits for power, he gets on base, but he does strikeout more than you’d prefer in a perfect world. We’re seeing the best of Avila now, for a second time. There’s no secret. He’s hitting more fly balls and he’s using left field more. It’s easy to draw that line because that’s exactly what he did during his excellent 2011 campaign. It’s hard to say exactly why 2017 Avila is reviving the summer of 2011. It might be health or it might be approach. 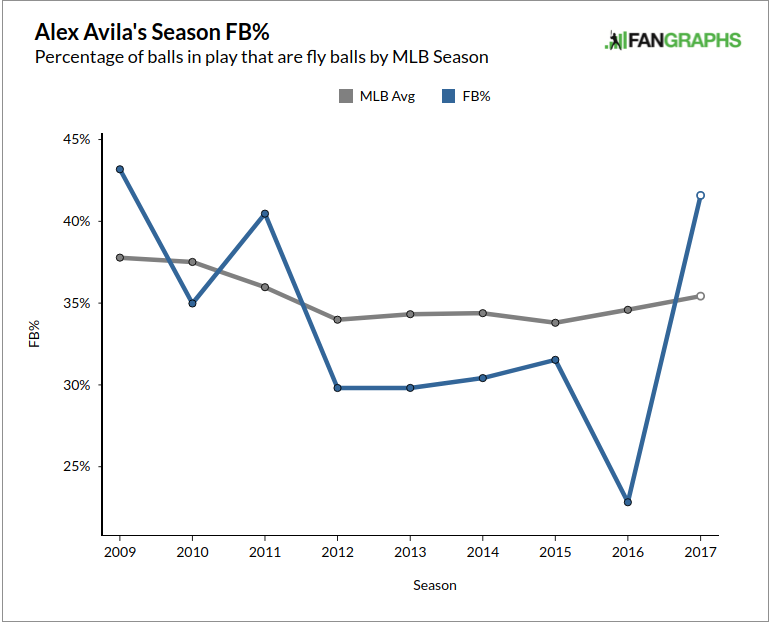 We can’t really say without getting inside his head, and it’s not like we think that he is a true-talent 170 wRC+ hitter, but getting three months of good Avila again is a good reminder that the skills are there when things are properly aligned. Living through this period has led me to reflect on two Avila-related points about which I’ve long-wondered. The first is that Avila’s 2011 season was something of a curse. He was a 24-year-old catcher playing in his first full season and he was amazing. While the All-Star trip, silver slugger, and deep playoff run were awesome, it set unrealistic expectations for the rest of his career. If you have your career year in your first year, everything after that will always disappoint people. 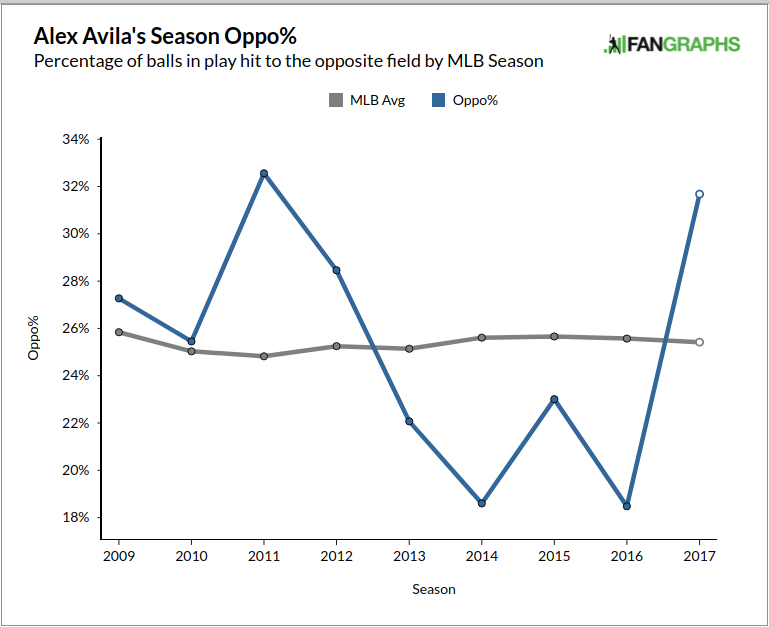 Avila had a truly dreadful 2015, but from 2012-2014 he was a solid major league regular behind the dish when he was out there. He was a league average hitter and being league average and also catching makes you pretty useful. But it never felt like that to a lot of people because he looked so much worse than he did in 2011. Rather than people treating it like his one fluky great year, everyone looked at him like he had collapsed and that’s probably not fair. The other big thing I’ve wondered about is whether Jim Leyland broke Avila when he rode him so hard down the stretch in 2011. If you recall, during the early part of that year, Victor Martinez served as the other catcher, but when Martinez suffered a minor injury he stayed in the lineup but wasn’t able to catch. Because of exactly how the roster was set up, the Tigers basically played with one catcher for an extended period of time. Avila was playing so well and the roster was tight so Avila didn’t get a real break until rosters expanded. Then when the playoff push came he obviously had to catch every inning. By the end, he was in bad shape. I’ve always wondered if things would have been different if Avila had been used more cautiously in 2011. Maybe it wouldn’t have mattered and the bangs and bruises, and later concussions, would have gotten him anyway. It’s impossible to know, but maybe the lighter workload over the last two seasons has allowed him to recover and his 30-year-old body feels better than he did at 27 and 28. It’s probably going to end with Avila traded to a contender, and I’ll be happy to see him get another shot at the title he didn’t win in Detroit. Avila’s always been a favorite of mine and his success, despite the team’s struggles, has been a nice development. Sometime during the next thirty eight days the Detroit Tigers will make a decision about the direction of the franchise. To be fair, every team will make one, but the Tigers decision will be more consequential because of what that decision is likely to be. The Astros and Dodgers will decide to make a run at the 2017 World Series, but they made a similar decision this winter and it doesn’t qualify as news to continue doing something you were already doing. The Tigers, on the other hand, are likely to make a organizationally-altering choice sometime during the next five weeks. The Tigers have contended in eight of the last 11 seasons and only one of the three bad seasons (2010) happened on purpose. The Tigers were supposed to be the team of the century when they stumbled in 2008 and were certainly considered dangerous in 2015 as well. The team entered 11 of the 12 seasons from 2006 to 2017 intending to play well and make deadline acquisitions to help them play better. This will only be the fourth time during this era in which the decision in July is obvious. They must sell. What makes this moment different is that this is the first deadline without a championship-starved Mike Ilitch looking impatiently over the shoulder of the the general manager. The Tigers sold effectively two summers ago, but they only traded players who were set to be free agents and did not expect to re-sign. It was clear to everyone in July 2015 that the Tigers intended to try again in 2016, and they tried very hard that winter to build the club back into a contender. They got close. But this year the conversation is different. JD Martinez will be traded because he’s an elite hitter who will be a free agent in four and a half months. K-Rod is a free agent who might be traded but not for anything of substance. Alex Avila is a free agent at year’s end and thanks to his great first half will bring the team back something solid. But the bigger question is whether the Tigers will take the opportunity at this deadline to tear the team apart, punting at least on 2018 in the process. That isn’t a question Tigers fans have faced. In each of the previous disappointing seasons, the question was always about the best way to win next year. For the first time that mandate appears to be absent. So we turn to Ian Kinsler and Justin Wilson. But also inevitably to Justin Verlander and Miguel Cabrera. It seems pretty unlikely that Kinsler and Wilson will be part of the next Tigers winner, as both are free agents after 2018. Justin Verlander, in his 12th season in Detroit, is only under contract through 2019. Cabrera’s deal runs six more seasons with two options, but time is starting to wear away at him as well. The question the Tigers will ask is whether a contending team is possible in 2018, and while it certainly is possible, it’s challenging. They aren’t just one or two players away. The players they have need to play better and they need one or two more players to supplement them. Making that work within the budget they’ve set will be difficult. And if 2018 is gone, so are Kinsler and Wilson. And if 2018 is gone, does it make sense for Verlander to stay. And if you’ve cleared the deck of all the desirable veterans, where does that leave the certain Hall of Famer who plays first? This domino-ing could sweep up Iglesias and Castellanos. Maybe Upton too. This seasons is essentially over. They’d have to play like a 95-win club the rest of the way to get to 85 wins and a 105-win team to make it to 90. If 2017 is over, you must consider 2018. And if 2018 is a pipe dream, nearly every player should be on the block. This is as existential as it gets when talking about baseball rosters. Once the Tigers commit to the end of this year — a commitment that is coming any day — we have to consider the implications that it will unwind an entire decade tied together with the yarn of Justin Verlander and Miguel Cabrera. There’s nothing to be said about 2017 except for the fact that the die had been cast. The Tigers decided after 2015 that they wanted to make a run in 2016 and once that decision was made, there was nowhere to hide. There was no way to abandon 2017, but there was no mechanism to get much better this winter. They rode it out, lost, and are now faced with the inevitable. Selling now is nothing. It’s not controversial or emotional. The season is over, baring a miracle. But the season being over might also mean that everything is over, and that’s a weighty thought. It’s hard to maintain a competitive team for a decade. The Tigers made the decision not to contend preseason just once in the last 12 years. For the first time since before I was old enough to drive a car, the team is looking at a rebuilding cycle. That’s something, but I don’t know what. I’m not opposed to the idea; it might actually be a lot of fun. The team will lose games but there will be new faces and exciting young players coming up through the system. The stakes will be lower and the day to day stress of the games will be easier to manage. Taking some time to nurture a new generation of Tigers is appealing. On the other hand, taking that step will require us to come to terms with the end of something. Verlander is the only holdover from 2006 but Cabrera has been around since 2008 and the remaining turnover has been gradual. There’s definitely a Leyland period and an Ausmus period, a Dombrowski and an Avila, but this has felt like a series of chapters in the same novel rather than an entirely new team each year. There’s a good chance that will end sometime in the next 38 days.